Vinegar and oil, soda and pop rocks, Burger King and McDonald’s: those are just a few things that don’t quite mix well together. Well, except that last one, apparently, as The King is calling on the Golden Arches to set their differences aside and give consumers what they want: something called a McWhopper. But it appears this unholy alliance won’t see the light of day, as McDonald’s just isn’t felling the love for its archrival. Burger King peppered its social media accounts with missives, created a special website and took out full-page ads today, proposing that the two fast food giants join forces to create a mashup of their most infamous menu items: the Big Mac and the Whopper. As far as Burger King’s previous attempts to drum up publicity – Left-Handed Whopper and the Whopper Freakout — this one seems to be rooted in a good cause. Burger King says the campaign to “settle the beef” was created to raise awareness for Peace One Day, an organization that raises awareness and encourages action for Peace Day. The day, celebrated on Sept. 21, was designated as the annual International Day of Peace by the United Nations back in 2001. While Burger King seems to have put its heart on the line in the name of publicity and raising awareness, McDonald’s doesn’t appear to be reciprocating. The company’s CEO Steve Easterbrook turned down Burger King’s proposal early Wednesday, saying that while the inspiration is for a good cause, the two companies just don’t belong together. “We love the intention but think our two brands could do something bigger to make a difference,” Easterbrook said in the Facebook post. The message, while short and to the point, appears to take a few pointed jabs at the King’s efforts. Easterbrook ends the response noting that a simple phone call would suffice next time Burger King has a big idea. Had McDonald’s agreed to the collaboration, the two companies would have sold the McWhopper at a pop-up store in Atlanta on Peace Day. Customers won’t have to shell out big bucks for the special sandwich, instead they will pay simply by declaring to end the “beef” with someone they know, the Wall Street Journal reports. 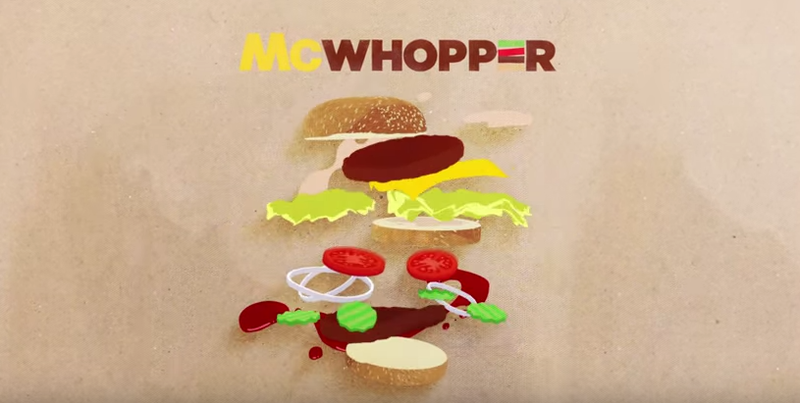 It’s unclear exactly what the McWhopper would have entailed, but Burger King’s ad suggests it would be “a big burger with big ambitions,” whatever that means.